Rudbekia are also known as Black-Eyed Susan or Glorioso Daisy. They will attract butterflies and make an excellent cut flower. They are also drought tolerant once they are established and they are deer resistant. Plant in full sun and well drained soil. These Rudbekias will bloom from summer to a hard frost. Denver Daisy Rudbekia will grow from 18" to 28" tall and 25" to 28" wide. 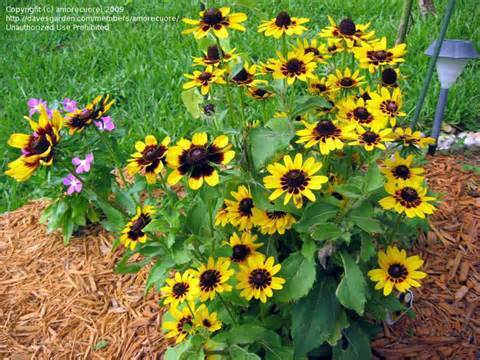 It has the traditional yellow petals and brown center of a Black-Eyed Susan. Prairie Sun Rudbekia will grow from 28" to 36" tall and 18" to 36" wide. It has yellow petals with a tinge of orange and a green center. Prairie Sun Rudbekia was an All-American Selections Award Winner in 2003. 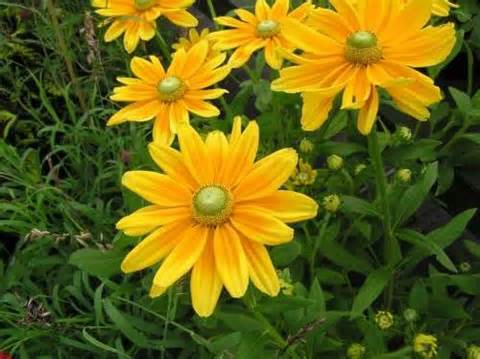 Indian Summer Rudbekia will grow from 36" to 42" tall and 24" to 42" wide. It has yellow petals and small brown center.